We sell metal materials widely including structural steel, stainless steel, tool steel, high alloys, and titanium and can supply regular and customized size materials quickly. In addition, we can deal with forgings, polished steel bars, and machined products. We are performing inventory sales of duplex and super duplex stainless steel! : JIS SUS420J1 Only our company has inventory in Japan! Heat treated materials (also some annealed materials) 32 dia. to 150 dia. Ground materials (CG materials) and pipe materials are also available. 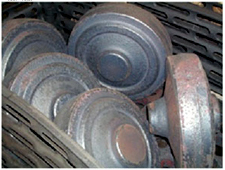 We have abundant inventories of S31803 and S32750 round bars. 20 dia. to 300 dia. : Sales of abundant types of magnetic materials! As for sheets and round bars of SUY (pure iron) and 3% Si steel, depend on us. Requirement for forgings and heat treatment can be satisfied. We can deal with even small lots. Permalloy (PC and PB), Invar, and Super Invar are available. : Did you experience any difficulty in purchasing materials complying with foreign standards? 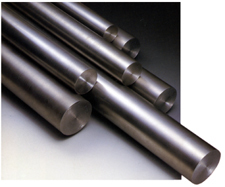 We have lots of experience in obtaining round bars complying with ASTM A105, F11 and F22. When you require F1, F5, and F91, which are difficult to obtain, consult us. We are exporting from special steel manufacturers in America, Europe, and Asia. : We have lots of experience in selling steel materials, forgings, etc. If you feel difficulty in obtaining materials complying with ASTM, DIN, etc., contact us.